A few months ago I was introduced to Laser skirmish and I am not talking about the little kids game or walking around with a flashing vest and a sci-fi pistol that has a range of a few meters but taggers of a realistic look/weight/range and sound(Tech Assault). Since then I became a little hooked and in wanting to bring more to the game I started working on a new project. With prototypes on my desk and purpose build boards designed by me on there way I can hardly contain my excitement. 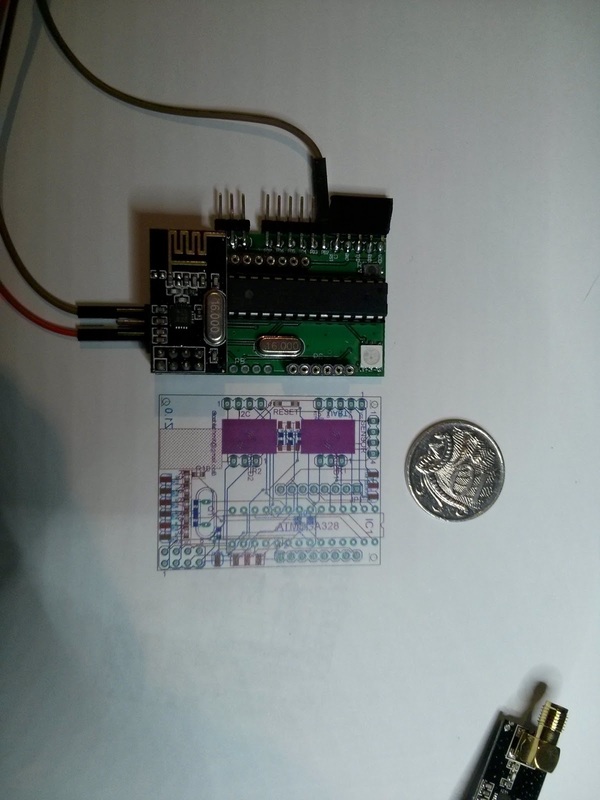 The RFnode playerZ board is an Arduino based board designed for laser tag. The software is based off the Miles Tag protocol version 1 so is compatible with other systems based that are also using this protocol. Each board contains a radio that is used to realtime scoring, proximity functions, wireless configuring and node grouping (a number of nodes can make up a player). The board is designed to be ether a Zombie headset to be worn by a player or as the internals of the Laser tagger. · Programmable radio output: radio can be set to only send short range signals that are only received by other nodes within a few meters. · Lithium battery with micro USB charger built in. Each headset has 2 IR leds for emitting short range Zombie damage from the Zombies head to any other player within range. Zombie damage is also transmitted via low powered RF to other players within 2-3 meters of the zombies. Zombies have IR hit sensors positioned on the front and back of the head. The board (node) can also be used as the internals of a player’s tagger. The player can choose to have a head sensor wired to the tagger (Currently how most laser tag is played) or the node can be grouped to a player wearing a Zombie headset. 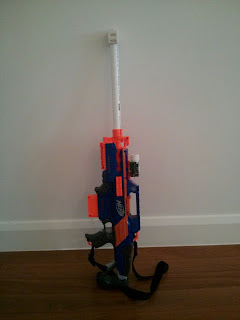 Can be added to Nerf guns in a none destructive way (clips to Nerf rails). The MilesTag protocol only supports 256 unique players (8 teams of 64 players). For us to be compatible with MilesTag and compatible systems this affects us too but it only affects the IR data, our radio code supports 65025 unique nodes. As the boards support iButtons we can use these for in game pickups. This could be used for items like weapon upgrades, health packs or game objectives hidden around the playing field. We also support wireless Pickups too. Our nodes like to talk to our server and our server can talk back. Not only do we use this for real time scoring but we can also use this to send you power ups mid game. Don’t like your taggers gun profile? Just use your smartphone or a connected device to select a new one and we will update your tagger with a new one. Want to know where you team is? We can tell you which nodes they are near on a map. Want to know your stats mid game? we can give you more data then you poke sharp stick at. One of the new designs compared with RFnodeB1 board used in current prototypes. 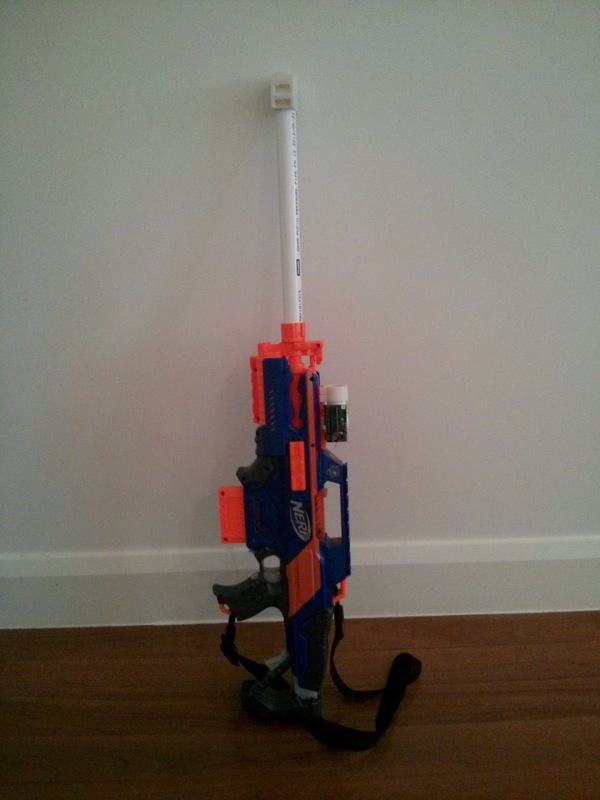 My Modded Nerf gun with attached board and lens. Nerf gun is dual purpose can be used for lasertag and can still fire Nerf.